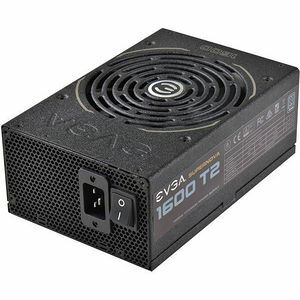 Introducing the EVGA SuperNOVA 1600 T2 power supply. This power supply raises the bar with 1600W of continuous power delivery and 94% (115VAC) / 96% (220VAC~240VAC) efficiency. A fully modular design reduces case clutter and 100% Japanese Capacitors ensures that only the absolute best components are used. What does that mean? The best stability, reliability, overclockability and unparalleled control. The EVGA SuperNOVA 1600 T2 is the ultimate tool to eliminate all system bottlenecks and achieve unrivaled performance.